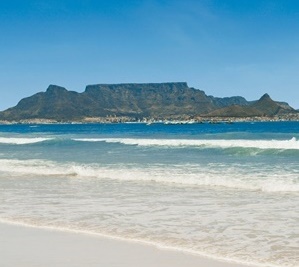 Your Cape Town & wilderness holiday will start with 3 nights in Cape Town. You’ll be staying in Camps Bay, directly across from one of Cape Town’s most iconic beaches and walking distance from many great restaurants. Camps Bay is also a good area to be in for exploring the rest of the Atlantic Seaboard. We recommend taking a scenic drive along the coastline towards Hout Bay, perhaps having lunch and doing a bit of shopping at the Hout Bay Market or driving a bit further to swim with the local penguins in Simon’s Town. 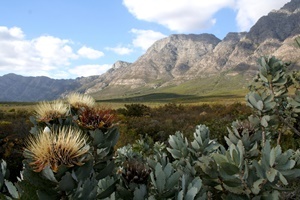 The next part of your Cape Town & wilderness holiday takes you to the Cederberg Wilderness region. The Cederberg is famous for its unusual rock formations and the stunning carpets of flowers in the spring time. 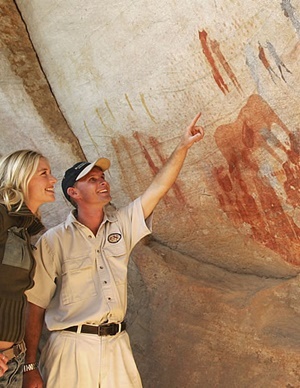 We recommend a guided tour to uncover some of treasures of this wilderness area, including ancient bushman paintings. You’ll spend 2 nights here, where you can relax and enjoy the fresh mountain air and tranquillity of this remote and area, before heading off for the last part of your Cape Town & wilderness holiday. 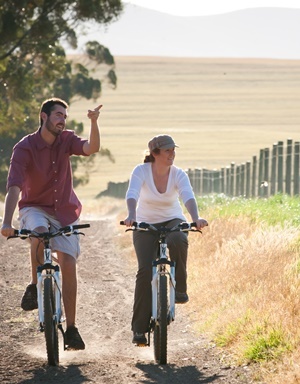 The last part of your trip brings you back to the Cape Winelands area where you’ll spend the last 2 nights on a working farm that is a destination in its own rights – from delicious meals, to the freedom to take a mountain bike and cycle through the private reserve between zebras and antelope or try your hand at some canoeing on the large lake. We can also recommend extending your trip by a few days and taking the Franschhoek Tram to visit some of the nearby wine farms – a super way to get around and explore this beautiful area, and perhaps spend an evening eating out in South Africa’s culinary capital. Arrival in Cape Town International, collect your hire car and drive a quick 30 minutes to Camps Bay where you will be spending the next 3 nights. You will have 2 full days to explore the Cape Peninsula, visit the penguins in Simonstown and take the cable-way trip up to Table Mountain. Accommodation is at The Marly in a lovely mountain view room with breakfast. After breakfast take the scenic road to the Cedarberg region where you will be spending the next 2 nights enjoying the pristine wilderness of this area. During your stay guides will take you on nature drives where you can see antelope and zebra, visit the bushman paintings, take a hike or try some fly-fishing. There are canoes for your use as well as mountain bikes to go exploring. A well equipped spa offering a range of treatments is also highly recommended! With clear night skies, star gazing is amazing as well. You are staying at Bushmans Kloof in luxury rooms including all meals plus all nature activities. After the mornings nature experience and breakfast, take the road again travelling to the Wellington Winelands area – a very scenic region with a variety of wine farms and country atmosphere. You stay at Bartholomeus Klip Farmhouse for the next two nights in a gracious Victorian Manor house. Activities include a morning and evening game drives into the nature reserve where there is a variety of animals to see. You are also encouraged to make use of all the facilities – take a mountain bike ride exploring the farm at your own pace, or a gentle stroll through the farmlands. Canoe on a lake or just curl up with a book under the trees absorbing the peace and tranquillity. Delicious meals and all activities are included in your stay. Enjoy a last breakfast and the peaceful farm surroundings before it’s time to leave. The drive back to Cape Town International airport is only an hour and we can recommend taking a leisurely drive through the Winelands, stopping off at one of the estates for a lazy lunch before making the final trip onto the airport to meet your connecting flight back to London.